African wild dogs - what makes them such fascinating hunters? In this post, we will look at the world of the African wild dog in the wild. In the process, we will clarify why they are considered to be as one of the most efficient hunters in Africa. It is when they hunt that the important role of the pack becomes very clear. They hunt by day, usually in the early morning or evening and occasionally in the moonlight. African wild dogs are an endangered African animal. Also called the hunting dog or the painted dog, these wildlife animals are currently disappearing from Africa at an alarming rate. Wild dogs are active during the day because they hunt by sight, although they sometimes take advantage of bright moonlight to hunt at night. Like most African animals they tend to rest in the shade during the hottest part of the day. These African wildlife animals require vast ranges to roam. For this reason, it is only the largest of protected areas like the Kruger National Park or Hwange national Park that can maintain viable populations in the long term. Their need for huge areas is just one of the factors that make them one of the most endangered species in Africa. 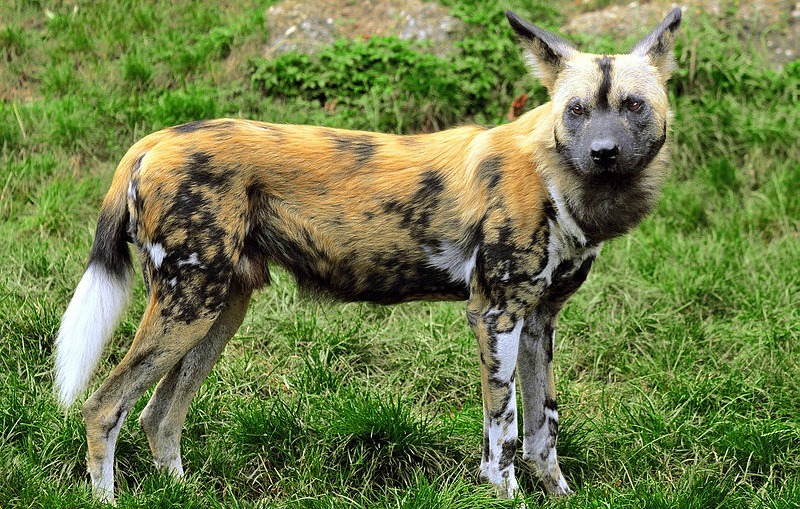 How do African wild dogs breed ? Typically only one pair in the pack breeds. Very rarely will a second female give birth and if this happens the dominant female may kidnap and raise her young. In extreme cases, she will even kill these pups. This is done to maintain an optimum pack size. Wild dog mothers have their pups in underground holes like old aardvark diggings. Males will stay in the pack and help raise subsequent litters. The females leave the pack to seek out other breeding opportunities, as soon as the pups are grown ups. The males stay behind to form the core of the pack. The pups begin to wean at only two weeks of age. The whole pack regurgitates meat for them will contribute to raising them if the mother should die. 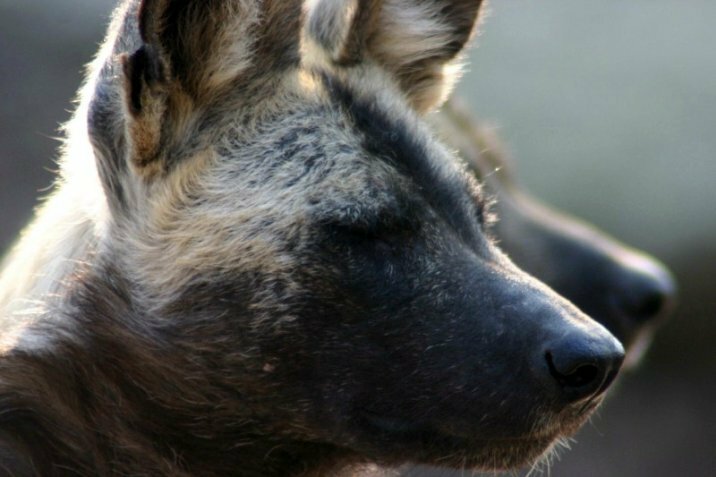 How do African wild dogs communicate with each other? Intense social interactions, mostly involving sniffing and muzzle licking bond African wild dog packs. When they are excited, such as before a hunt or just after a kill they will give a high-pitched twitter. These African animals have a very strong body odor. Dogs separated from the pack track their way back to it by smell. Their long-range contact call is a musical "hoooo" that carries for 2 to 3 km. They also whine when begging and their alarm call is a deep bark. Urine scent marks are used to show that an area is occupied. The dominant female will also scent mark to advertise that she is sexually receptive. The dominant male immediately urinates on top of her scent marks, to deter competitors. African wild dogs also communicate by body posture and tail position. Tail tucked between the legs signals fear and submissiveness. A friendly dog has an upright posture and it curls its tail up over its back. An aggressive dog will be rigidly upright. Adults, as well as pups, play. 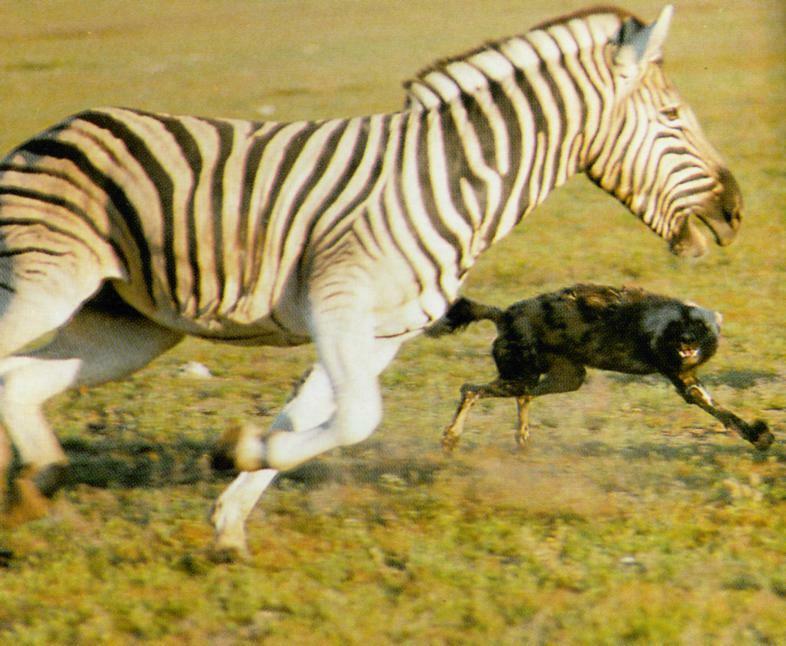 What methods do African wild dogs use to hunt their prey? They rely on their phenomenal stamina to tire their prey and the combined strength of the pack to bring the prey down. Often they make no attempt at concealment and approach potential prey openly at a slow trot. You will notice how they will keep their heads low and ears back. They will break into a run only when the prey flees. They may rush a herd into flight and then stand to watch to identify potential members of the herd that is slower than the rest. The leading dog, which is usually the dominant male or female will select a particular target and pursues it in a very single-minded manner. The rest of the pack will follow in lines behind the leader. It can happen that one of the other dogs chooses a different prey and so lead some of the dogs on another chase. In this case, the pack splits up and multiple kills may be made. As soon as the dog catches up with the prey it will pull it down if it is small enough. In the case of larger prey, it will run alongside and slash at its rump to slow it down until more dogs catch up. The dogs then bite chunks out of the prey and disembowel it. The prey then dies of shock and loss of blood. Wild dogs can reach speeds of 60 kilometers per hour during the chase. This is too slow to catch a medium-sized antelope during a short sprint chase. Instead, they depend on their stamina in long pursuits to wear down the prey. Most chases cover 3-5 km pursuits to wear down the prey. African wild dogs play an important role in eliminating sick and weak animals amongst their target prey species. They are specialized hunters of medium sized antelope in the 15-50 kilogram range like springbok and impala. They will also take animals such as small as hares and occasionally warthogs and foxes. What prey do they prefer to hunt? Statistics indicate that kills in the Kruger National Park consist of 8% Kudu, 75% impala and 15% smaller antelope. In Southern Africa they do not hunt adult wildebeest and zebra. In Hwange National Park their diet consists of 54% impala and 23% kudu. 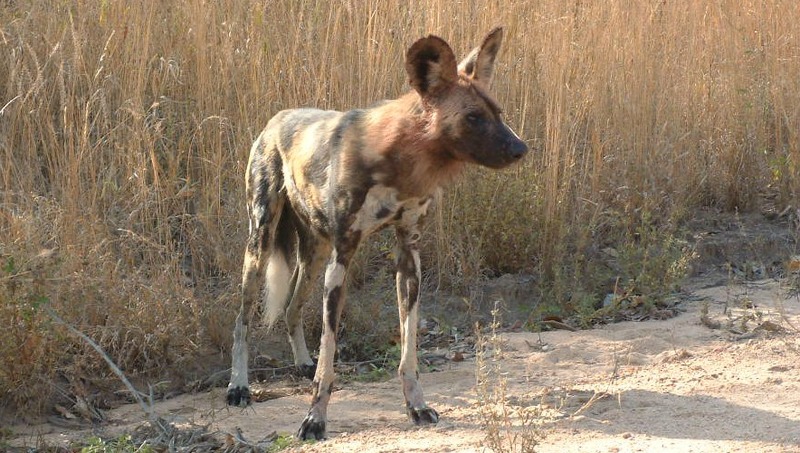 How successful are African wild dogs in their hunting efforts? Statistics indicate that the prey has only ten to thirty percent chances of escaping from African wild dog hunting expeditions. This compares to a six to eight in ten chance of evading an attack by lions or hyenas. What do we know about their feeding habits? They sometimes face intense competition from spotted hyenas that will team up with one another to push the dogs aside. This makes speed very important when they feed to avoid the kill being stolen. A pack of wild dogs is usually able to keep hyenas at bay because some of the dogs concentrate on guard duty while the others feed. Wild dogs have specially adapted teeth to consume a meal in the quickest possible time. These teeth allow them to shred the carcass of a prey rapidly because as a smaller African animals they always face the risk of having their meals stolen by other, bigger predators. 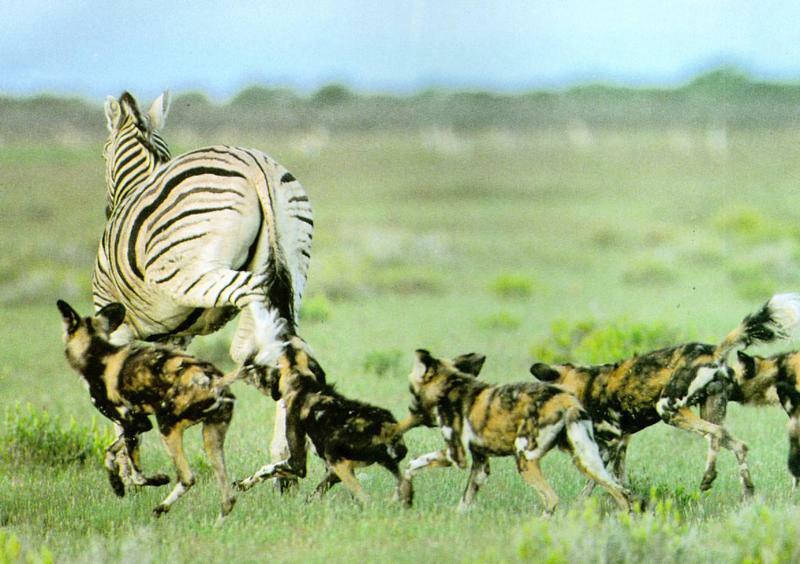 The larger the pack of dogs, the better their chances of keeping spotted hyenas at bay. They do not fight with each other like lion and hyena do during feeding. They can eat 100 kilograms of meat from an adult kudu in 15 minutes. A very important part of the wild dog hunting and feeding behavior is the division of the spoils after a successful hunt. Some dogs do not participate in the hunt because they remain behind at the den to guard puppies. When the pack returns from the hunt, these dogs will beg food from other members. It does this by grinning, nudging and nibbling their lips, licking their faces, lowering its forequarters and raising its tail. Puppies will usually be fed first. 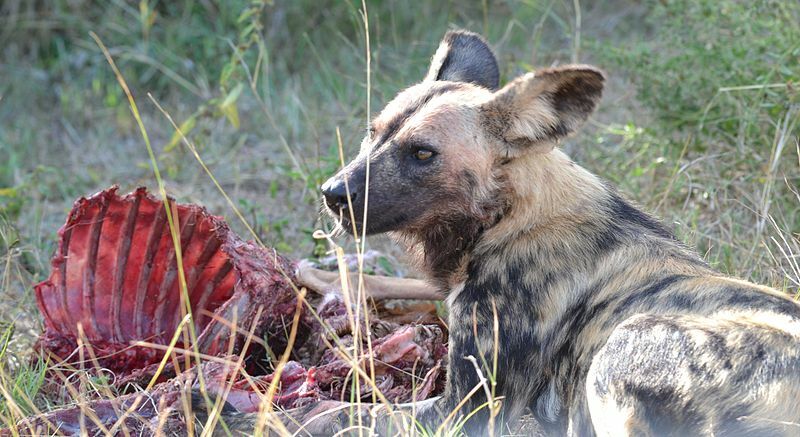 Sick and injured African wild dogs also receive a share of meat for as long as they remain with the pack. 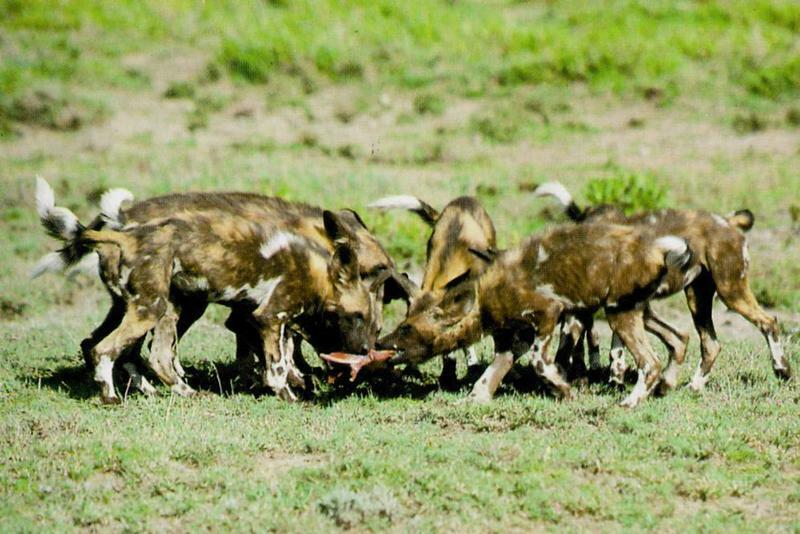 So can we conclude from this pack behavior that wild dogs are very social animals? Yes - these African animals live in packs that can consist of anything from two to over fifty dogs. Most packs have about between 12 to 20 adult members. A dominant male and female known as the alpha pair will head the pack. This pair will in the vast majority of cases, account for all the breeding activity. All pack members will help raise the pups. The rest of the pack will consist of the offspring of the current or previous alpha pair. 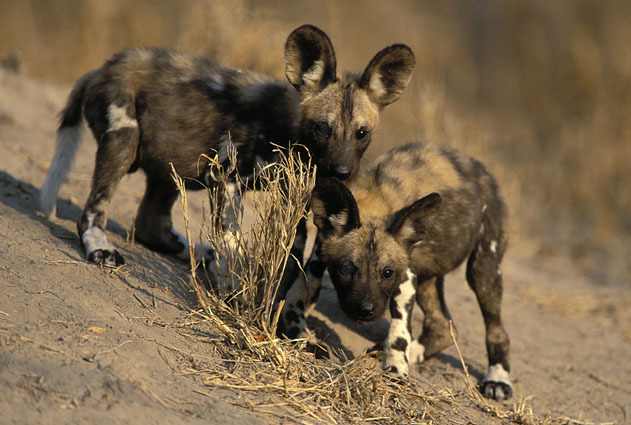 Wild dogs are unusual in that it is the females who leave their birth pack at 14–30 months of age and join other packs that lack sexually mature females. The males remain in their pack to become helpers. This is unusual because the opposite is usually true with social mammals, where a group of related females usually forms the core of the social group. Below the alpha pair there is no definite hierarchy. Submissiveness and not aggression, is the deciding factor during wild dog social interactions. A typical example of this is displayed when a dog who wants a piece of meat after a hunt. The dog will beg for some meat with head and forequarters flat to the ground, hindquarters raised, ears flattened to its head and lips drawn back. Our African wild dogs are seriously endangered at the moment. The main reasons for this are habitat loss causing the fact that we have fewer than 5,000 wild dogs in the wild. Their conflict with human activities as well as infectious disease worsen this problem. Please share your feedback, favorite African wild dog facts, and observations via the comments below.